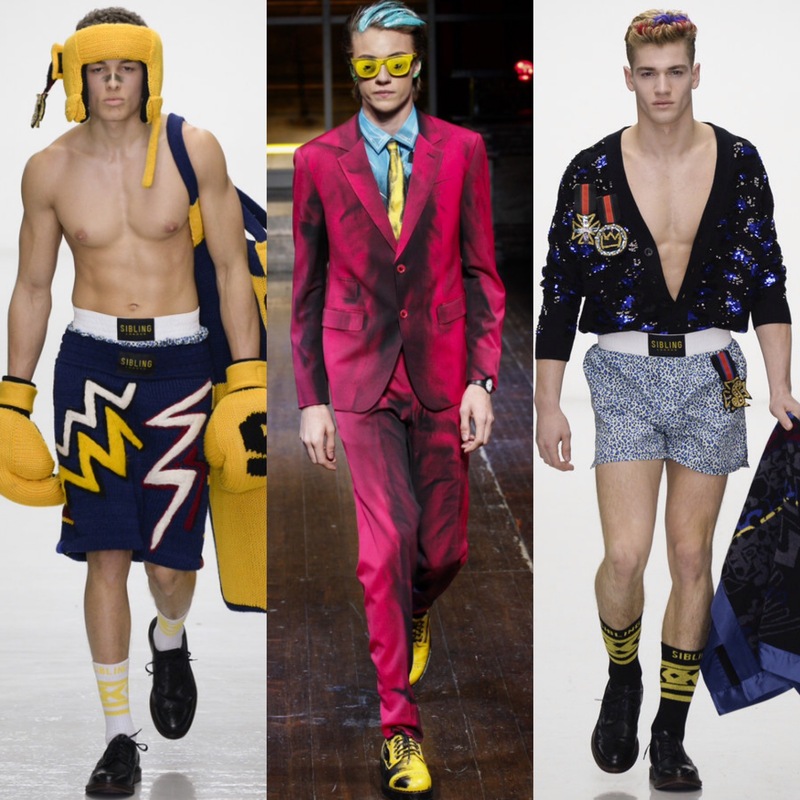 GuysLikeU’s fab fashionista Andrew Whitty picks out the coolest trends on show at this week’s London Collections: Men. It seems funny talking about the end of the year and Autumn 2016, when we’re barely halfway through what seems to have been the darkest, longest, wettest Winter in a long time. I’m praying we’ll get some snow before March when Spring hits so I can at least trick myself into thinking we’re all opening the doors of a wardrobe after spending the past few months in some sort of magical Narnia. If like Peter, Lucy and Edmund you’re longing for the thaw and the parting of the oppressive dark clouds you’re in luck as the new season catwalks boast a carousel of colour, albeit not for long. 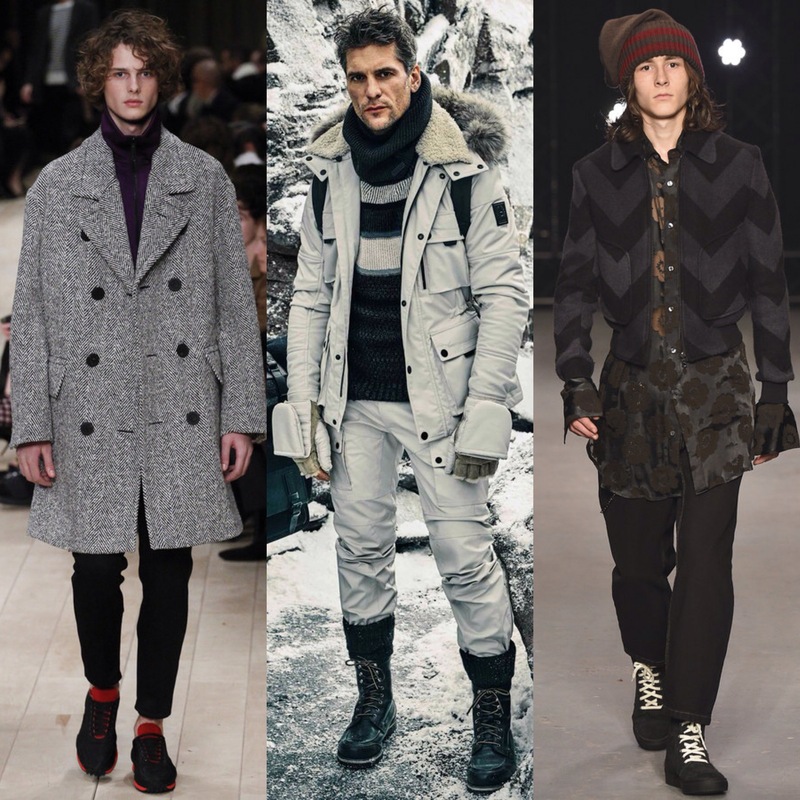 Judging by the catwalks of London Collections: Men, the following season of Autumn 2016 looks less The Lion The Witch And The Wardrobe and more Fifty Shades of Grey. Topman Design – opening the schedule yet again – proved to be pioneers of this trend. At their show on the morning of the first day of LC:M, Gordon Richardson and his team sent head-to-toe grey looks down the catwalk. Not the most exciting of colours, the point of difference came through in the textures and fabrics used – deconstructed wool suits, cable-knit roll neck sweaters and for me, a stand out chevron print bomber jacket all featured and courted the attention of the gathered crowd that included David Gandy and Dermot O’Leary. Grey – whether it be charcoal, metallic, ash or smoke – continued to pop up in the majority of collections across the four day event. At their presentation Belstaff used muted tones across the looks, giving the technical, outdoor pursuits pieces a luxury feel. Even Christopher Bailey, renowned for his soft, artsy aesthetic used deep greys to give the Burberry boys a much harder edge – this season’s catwalk a world away from the pastels and lace of the current collection. Not wanting to miss a trick, Bailey picked up on the secondary shade we’ll all be donning come September. It’s rare in menswear that a colour straddles the collections – let alone two rising to prominence. 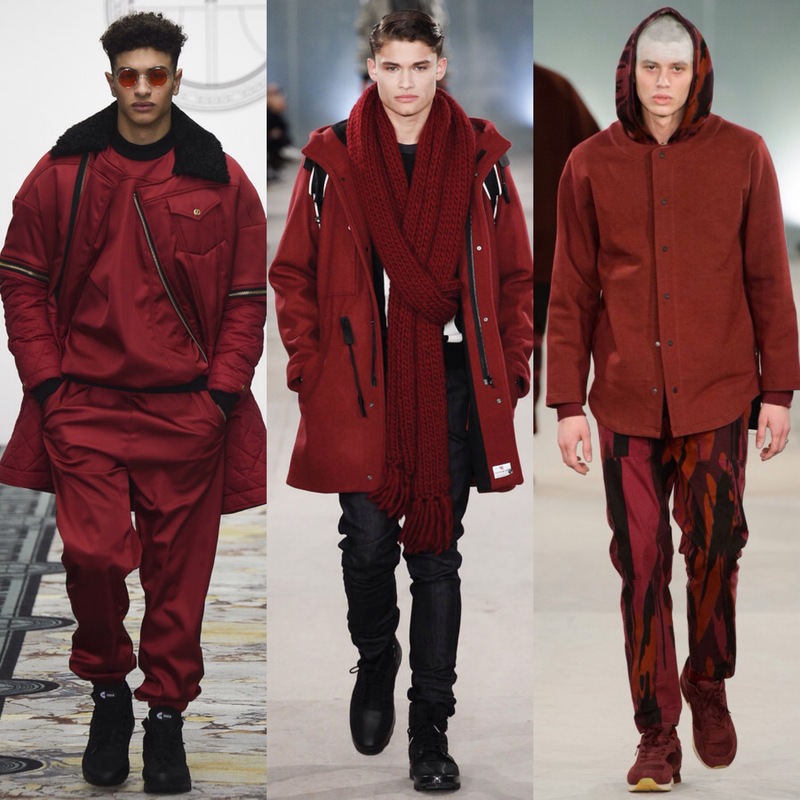 As guys, we tend to appreciate full, ready packaged looks – normally celeb inspired – rather than statement hues, but for the close of 2016 it seems we’ll all be reigning in red. It would be ignorant of me to call Astrid Andersen, Christopher Raeburn and Maharishi ‘the new kids’, as each designer has been carving a name for themselves for a more than adequate amount of seasons now. For Autumn they’ve all picked up on a different was to work red in to the wardrobe of their loyal customers hopefully securing sales and ergo the future nourishment of their namesake brands. Katherine Hepburn famously said, ‘If you obey all the rules, you miss all the fun’ and thankfully for those of us who don’t want to spend the season in such a somber mood, solace comes in the form of Sibling and Jeremy Scott at Moschino. The latter returning to the capital to show menswear for a second time, surprisingly shunning Milan and its design Renaissance. The catwalk at Moschino left no crayon unused as models sauntered in a every colour imaginable – neon pink, burnt orange, electric blue, Quality Street turquoise. You name it, Scott scribbled with it. Over at Sibling, design-duo Colette & Sid continued their crusade to make fashion less stiff with their bouncing, boxing beaus. We managed to stop staring long enough at the pecs and abs on show to notice the quality of the yarn and wools used to breathe the brand’s signature knitwear. If you’re going to invest in a piece this coming winter, be adventurous and make sure it’s a jumper from Sibling. For me, that was the common theme across LCM this season, non-conformity and pushing the boundaries of what is considered acceptable in how we chose to cover ourselves. Fitting as on the final day of the shows, the death of David Bowie was sadly made public. As we move into uncertain times, and the world becomes more hostile place one thing that must remain constant – our ability to live as freely as we want. Each designer on show at LC:M opened themselves up, allowing us to see how they want the world to be in the future. Fashion isn’t going to stop wars, cure cancer or eradicate extremism. 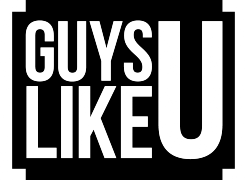 What it can do though, is offer a break from all that horror and simply allow us to exist in the now, because if we can’t do that we all may as well climb back into that wardrobe. Next Article'Loneliness led me to endless drug-fuelled sexual hook-ups!' WARNING GRAPHIC CONTENT!